Compass Presents are seeking enthusiastic and dynamic individuals to form part of our volunteer team for our new production Celluloid Sail. This is an exciting opportunity to be a part of a unique filmic experience spanning over two days and nights, which comes to Belfast June14-15. Celluloid Sail is produced in collaboration with the British Film Institute and is the flagship national event celebrating Britain on Film: Coast & Sea which is the culmination of a three-year programme of events dedicated to celebrating Britain’s onscreen heritage via archive film. 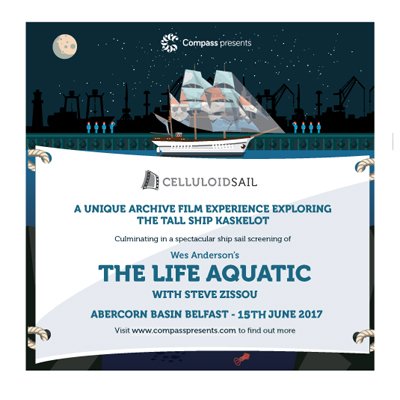 Celluloid Sail will take place on The Kaskelot ship, presenting live performance alongside film installation, archive screenings, and hinging around a screening of Wes Anderson’s cult classic feature film Life Aquatic. You will need to be available for a 3 hour shift on Thursday, 15th June. For further information and how to volunteer please contact [email protected]. Find out more about Celluloid Sail here.